The Japanese sub version of the Season premiere of attack on titan season 3 is going to be released on July 22nd. However July holds a lot more for the attack on titan fans. July is going to a very good month for the attack on titan fans. In this article I will detail the fans about the happenings of attack on titan anime and manga and What to Expect from the Month of July. Starting from the 9th of this month and onwards, attack on titan fans will get the monthly dose of the mange. Firstly on the 9th of July the manga readers will get the 107th chapter of the attack on titan manga series. Spoilers have already leaked on the internet. Since I tend to keep up with both the manga and the anime. We won't discuss it here because of the anime only fans. Attack on Titan Season 3 Episode 1 will premiere in select theaters across UK, USA & Canada on July 10th. Also the season 2 movie Roar of Awakening will also be shown at select theaters on July 10th (Sub Version) and July 11th (Dub Version). 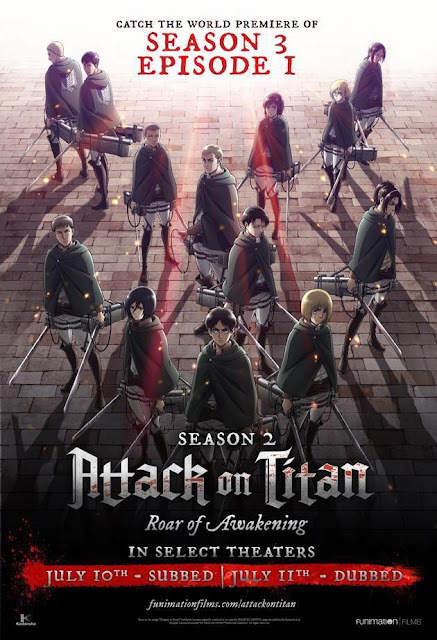 The season 2 movie called Attack on titan Roar of Awakening consists of the story from the anime episodes 26-37, which is the complete season 2. 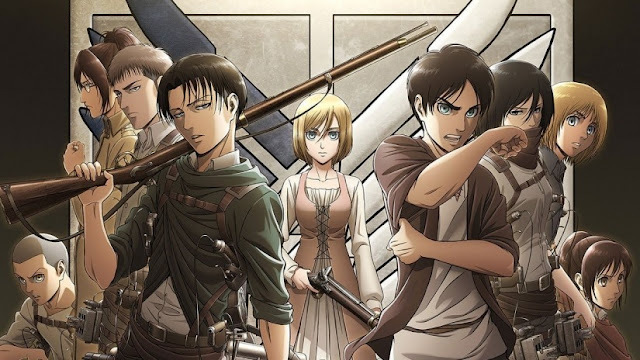 Since the Attack on Titan Season 3 Episode 1 will be shown to audiences by July 10th, you can expect spoilers to hit the web anytime soon by then. Because it will take almost 12 days for the season premiere to surface online. The Online Premiere of Attack on Titan Season 3 Episode 1 will be on July 22nd for the Sub version. However no details have been give about the release of the dub version. The series will continue after the scouts return to Tost district after suffering heavy losses from the armored, colossal and the jaw (Ymir) titans and the normal titans that roam outside of wall rose. Everyone's seems to be very excited for the anime. The anime ended in June of 2017 and has yet to resume. I guess now you know what to expect from the month of July when it comes to Attack on Titan. Hope you enjoy the Attack on Titan Season 3 Episode 1. Don't forget to follow my Attack on Titan Memes page on facebook. Don't forget to follow my blog Ali Khan Blogs on facebook & Twitter.